These the picture are links to video, so you can click there. 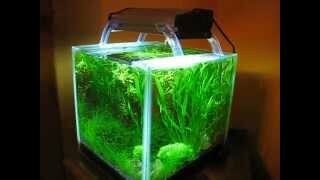 I have got a new cube aquarium. It has same size, it’s 30cm cube. 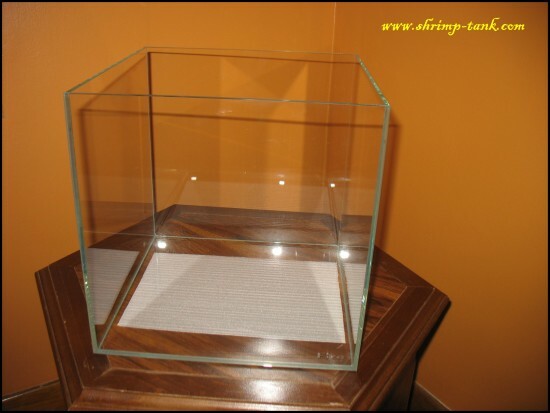 The biggest difference is that my new aquarium is very well-made, silicon are clear and it’s just a enough of it to glue the glass. 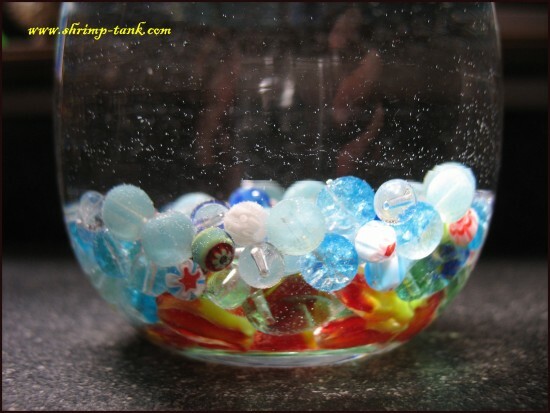 This new tank has StarFire glass. 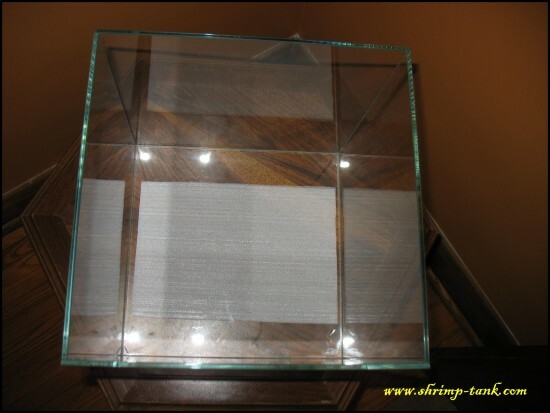 I use the same hexagonal brown night stand I have. I try to hide as much equipment as possible and the night stand really help me out there. 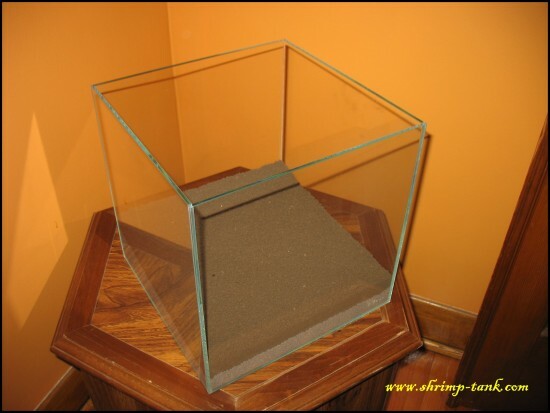 The biggest thing it hides is “Fluval 104″ canister filter. In my previous set up I used Seachem. 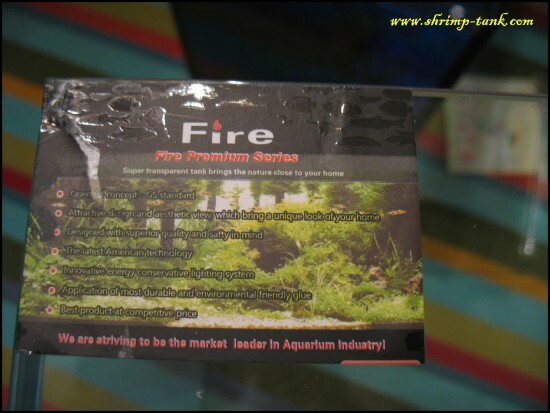 Flourite Black Sand which has nutrition for plants. I believe it did it’s job last time. However, I decided to use ADA Amazonia soil now. 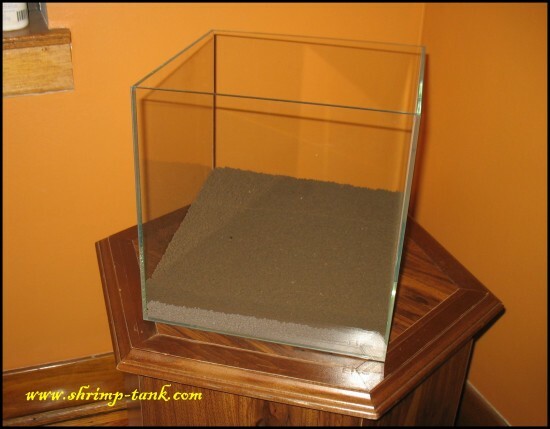 I used it a lot for my crystal red and tiger shrimps. 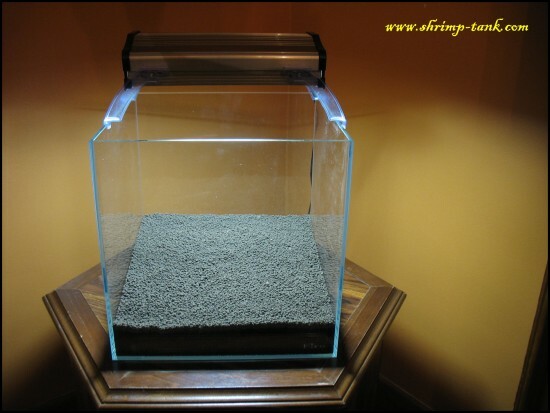 I decided to leverage ADA Amazonia soil ability to lower pH in my tank. Almost any plant will get benefits from lower pH and I should have less problem will growing plants. ADA in my shrimp tanks. I have placed my light fixture on the tank. This is a perfect light I got from Catalina Aquariums long time ago. It has 2 x 13W compact florescent bulbs, which make quite a decent light for this 8 gallon tank. On the picture below, you may notice that top and bottom layers of soil have different colors. You can see there that ADA is darker. Now the light is up. The aquarium looks much better with the top light, doesn’t it? One more picture that shows the soil closer. Next logic step is setupping an aquarium would be added the water. I used water prepared with Prime this time. 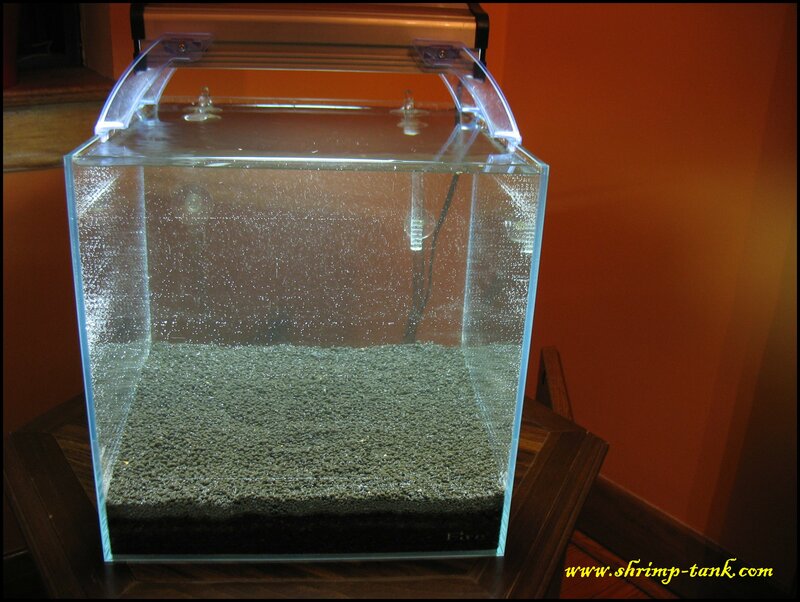 I have also placed a filter intake and outtake tubes and now you can see how this tank looks like with the water. I have to mention that you will try to repeat this, you water will be much darker that mine. The picture you can see below are, in fact, showing a tank with second water ‘refill’. 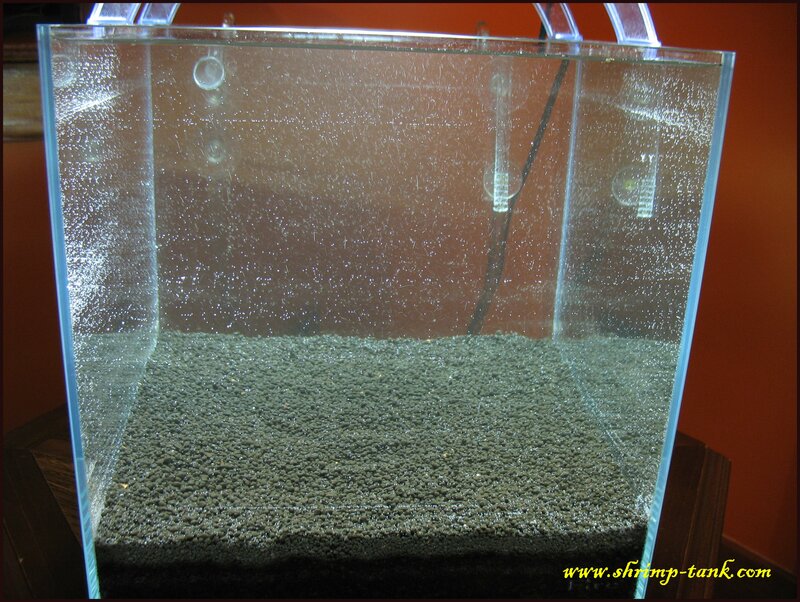 I filled the tank first time to 1/2 and them removed all that dirty water and floating dust and filled it again. So, do not be afraid if your new tank with the soil will not be clear right away. 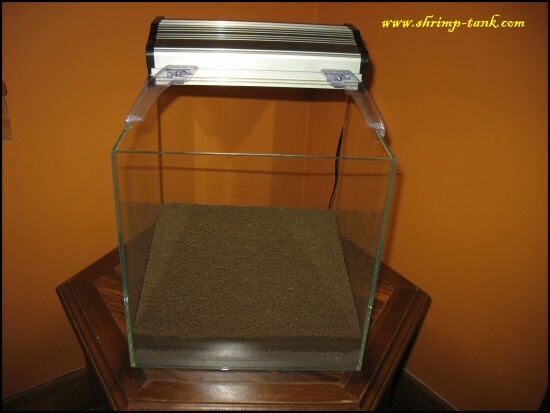 It’s not a problem, dust will settle down or will be collected by a filter. And the close-up view on the tank. Shrimp-Tank.com Iwagumi shrimp cube. New water means lots of bubbles. Ok, that’s enough work for Day 0. I will continue tomorrow about Day 1, where hardscape and plants will appear on the scene. There are several photos of one of my old tanks. As you can see it has lots of soft green algae. Algae as well as decayed plants are natural food for shrimps. 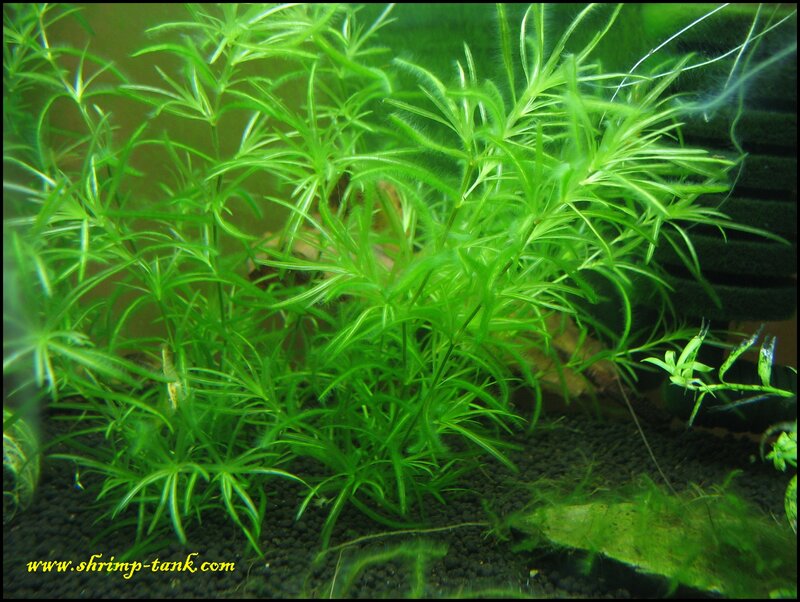 I grow algae in all my shrimps tanks. I just add extra plant fertilization and keep light working 24 hours for first several days. 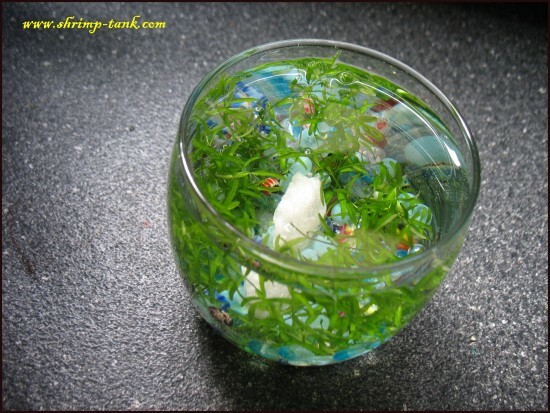 I found that soft green algae grow better in a lower pH. 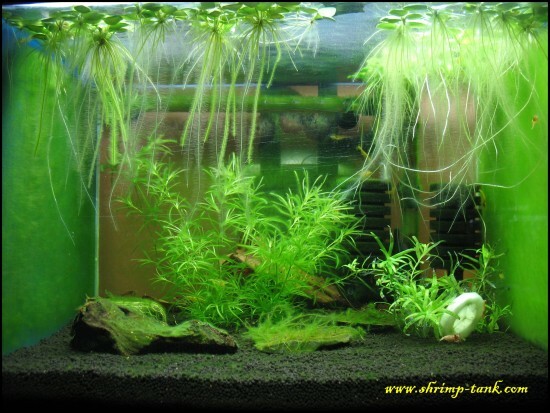 However, other algae will be good food for shrimps as well. 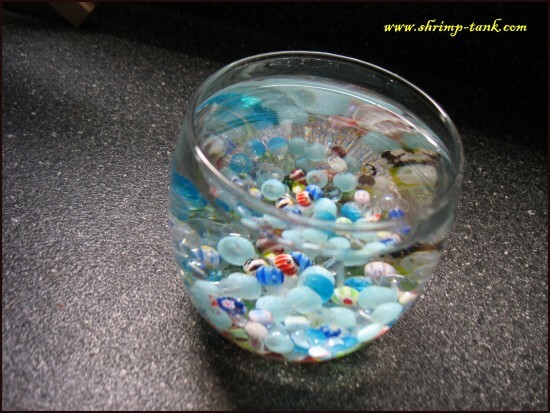 Our good friends presented us with a little glass and amazing colorful marbles. 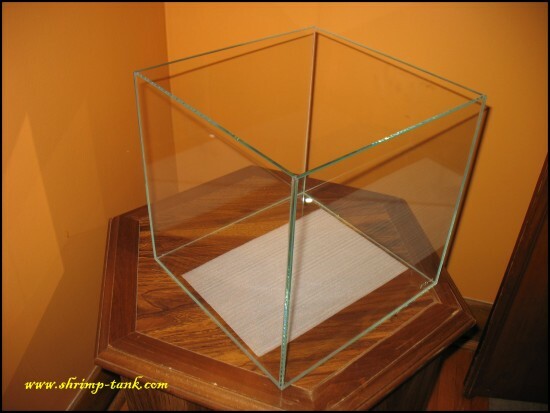 It was given as an aquarium for our young daughter. So, she got her tank. Fresh water made bubbles in the glass. 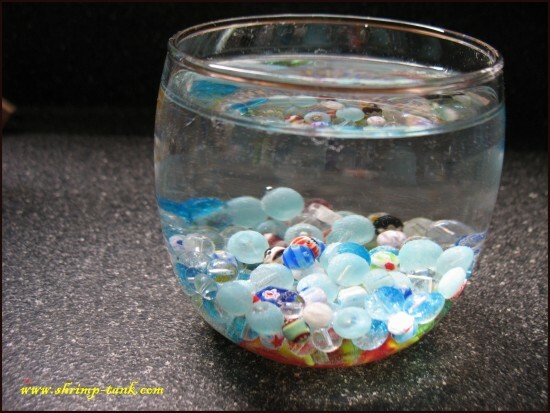 Look at the marbles, they are pretty cool. Then, Sonia wandered why she didn’t have plants in her own tank but all my tanks do. 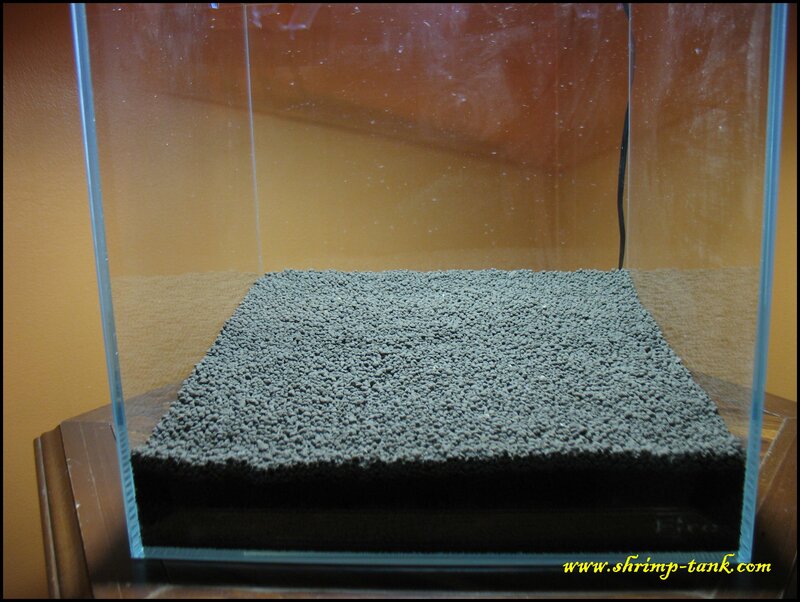 So I decided to put some pearl grass (scientific name: Hemianthus micranthemoides). I didn’t take too much time, her kid glass-tank is small and I spend less then 10 minutes on preparing plants and planting them in to the glass. Since almost all my have rocks inside, Sonia has selected a small rock that will fit her tank design. This rock is white quartzite. After some debated, we decided to put into the center. 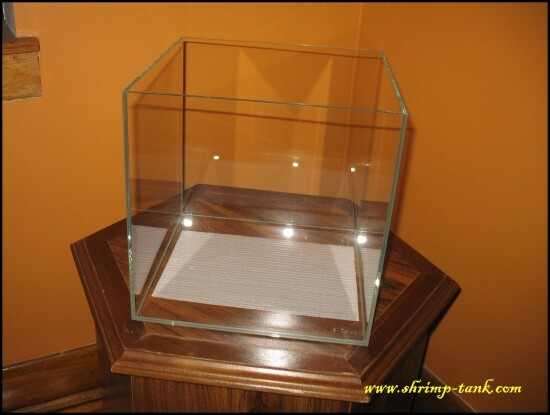 This aquarium is round and should look perfectly from any side. You can use this idea if your kids fell lonely while you are working in your fish room. 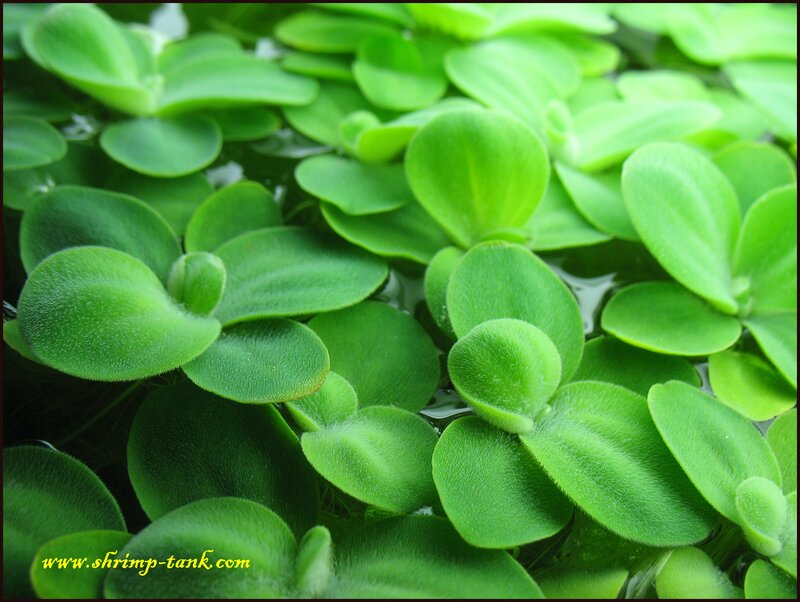 Mini Water Lettuce is another suitable floating plant for a shrimp tank. 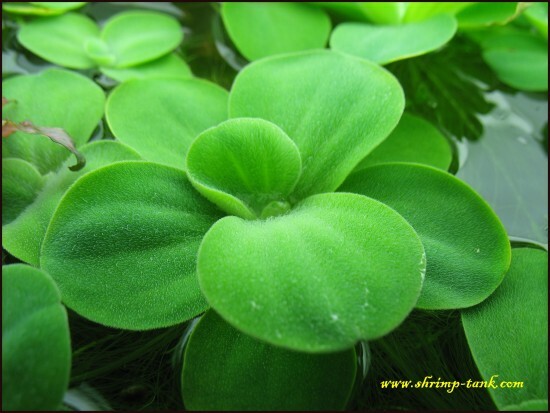 I was writing about amazon frogbit before. 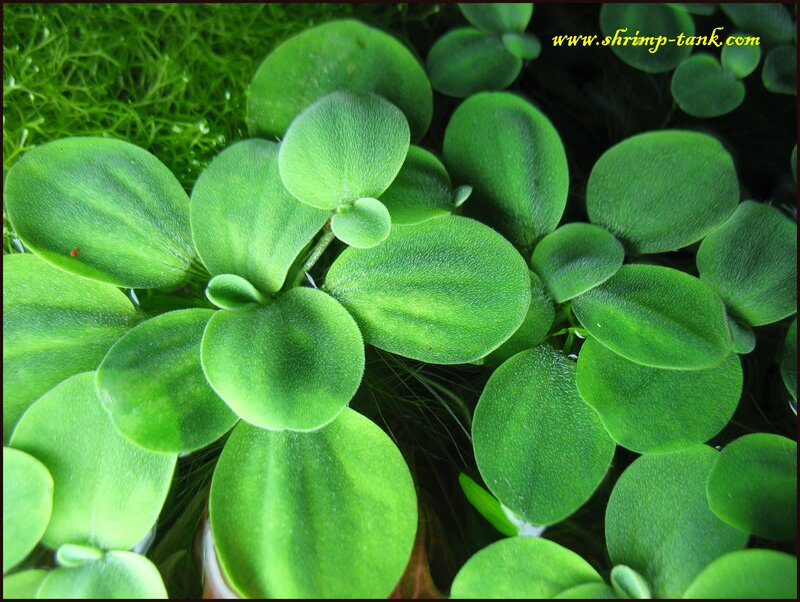 These plants are quite similar in keeping and grows speed. 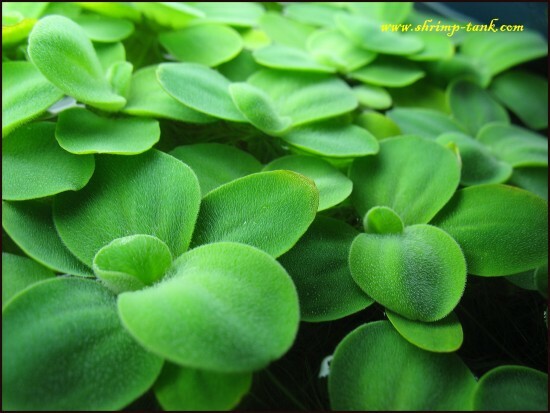 Scientific name of this plant is Pistia Stratiotes. 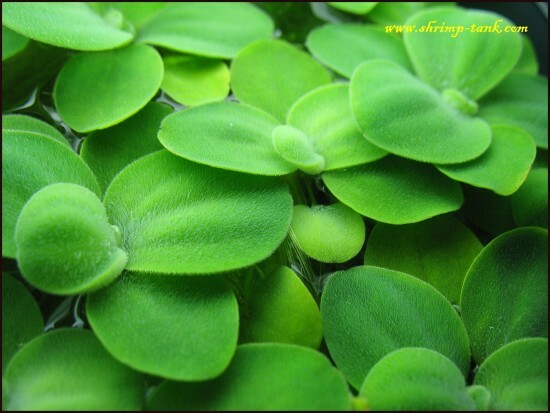 There are different varieties that mostly different in size and shape of leaves. Mine is small. 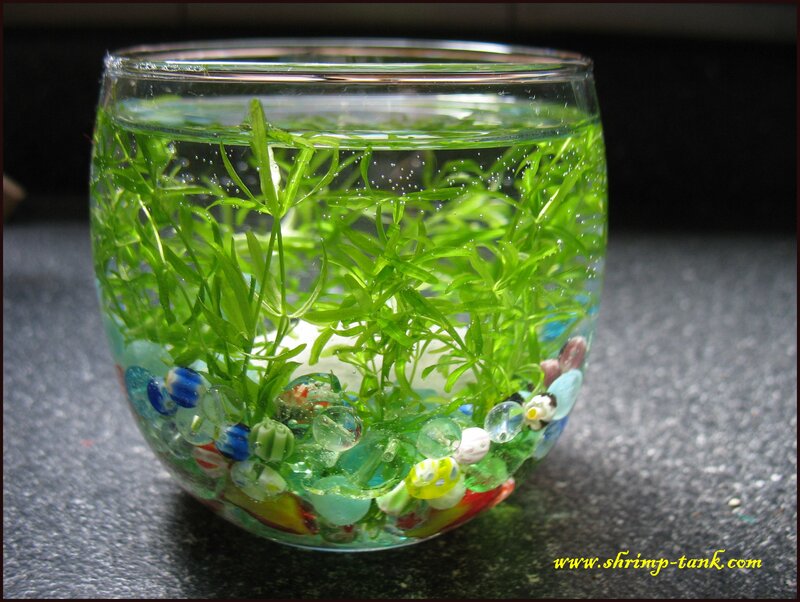 I keep it in aquarium not in a pond and It has rounded leaves. This plant look nice, that’s for sure. But that are the other benefits you will get? 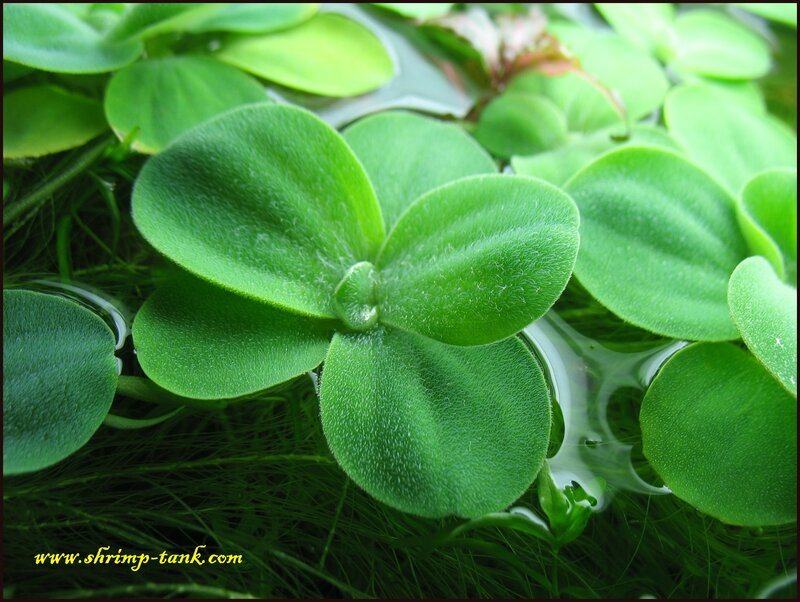 It clears water by using all ammonia, nitrates and minerals as fertilizers. It reduces light inside tank and significantly increases aquarium surface available for shrimps to hang on and bacteria to grow. 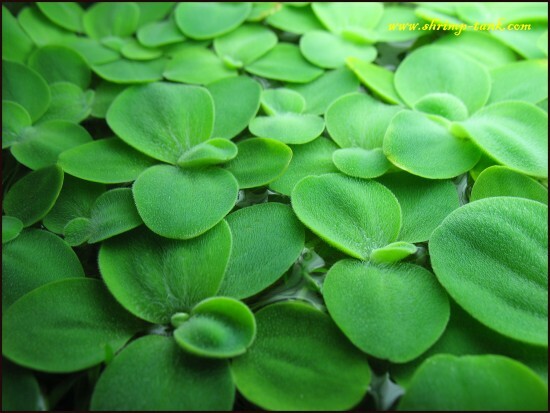 Another important advantage of water lettuce is low maintenance. Planting, cutting, tripping is not required. 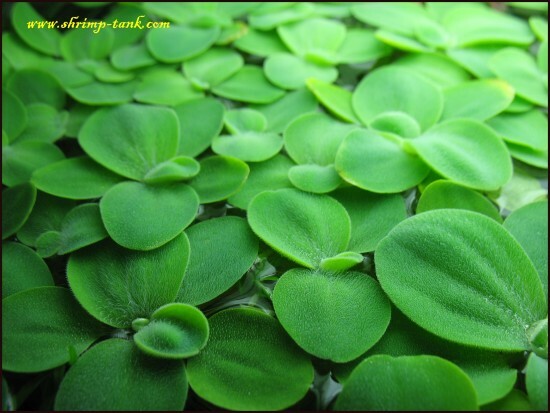 The only thing you need to do it remove some plants from your tank from time and not let it take over all the surface area and block all your light. 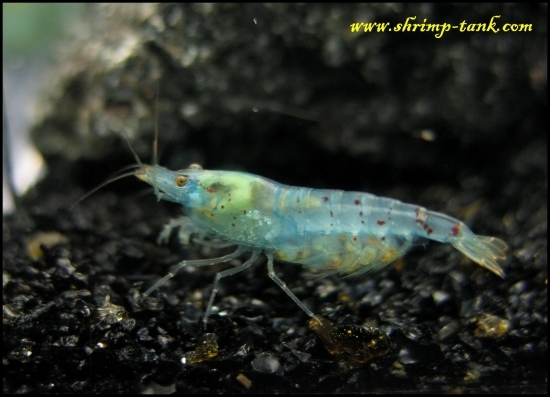 I almost forget that your tiger or amano shrimps will jump out less from the tank. Floating plant will serve as a tank hood Noticeable difference between mini water lettuce and amazon frogbit is roots. Amazon frogbit can grow very long roots that may turn your tank into a real jungle. 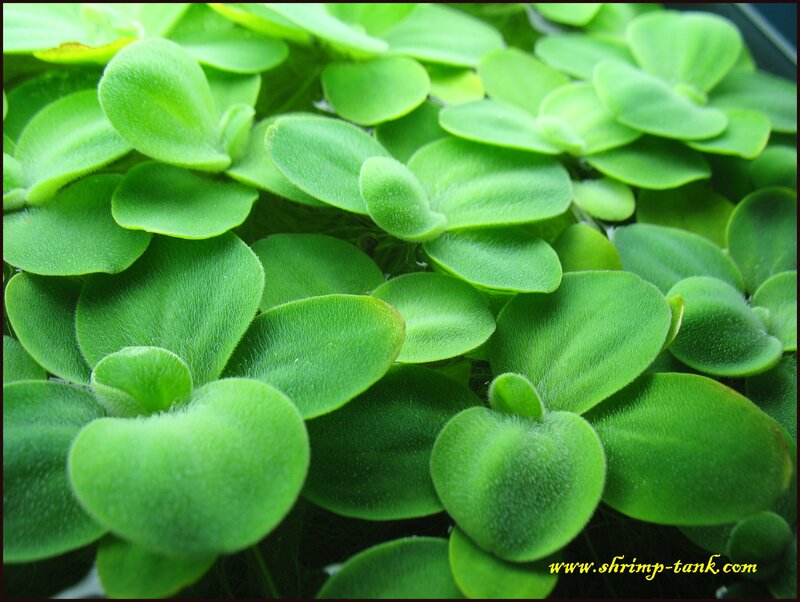 Mini water lettuce has shorter, but more bushy roots. I personally like their view more. Look at some pictures of mini water lettuceplant I made from the top of the tank.